“Welcome to Olare Orok” grinned the barefoot co-pilot as he flung open the doors of the Cessna Caravan and pulled down the steps to let the sunshine in. Waiting at the tiny airstrip were our Masai guides John and Dickson from Mahali Mzuri, Sir Richard Branson’s safari camp, one of five camps in the Olare Motorogi Conservancy in Kenya’s Masai Mara, an hour’s flight west of Nairobi. 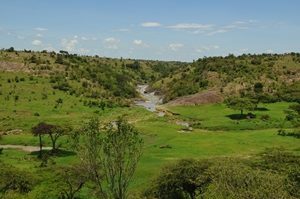 Branson’s camp opened in 2013 and works in partnership with the Maasai landowners to protect the ecosystem for the benefit of both community and wildlife. We’d had a number of guests stay at the camp in 2017 but I had not visited for myself so was very much looking forward to our stay. 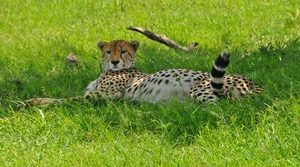 The transfer to camp in open Landcruisers is no more than 20 minutes but easily stretched to an hour as we discovered a beautiful female cheetah relaxing in the shade of an acacia within moments of leaving the airstrip. We then came across a huge herd of buffalo – 100 or more flicking their ears and munching the lush grass, enriched by early rains in the Mara. I was travelling with my wider family – seven of us in all. For the grannies, who both grew up in Kenya in the 50s it was a welcome, and emotional return. For my children, it was their first taste of East Africa. 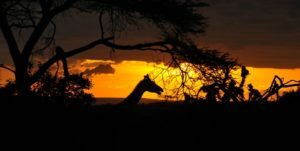 Mahali Mzuri means ‘beautiful place’ and we were not disappointed. The emerald cloak of the Mara in late March was captivating. Early rains had given the landscape a freshness and vibrancy. The camp itself overlooks a valley with a rocky river at its heart. Giraffe lolloped along the valley as we settled down to an alfresco lunch, ably looked after by Johnstone, who had all our names within the first five minutes. Swahili started to come back to the grannies after a wine or two, much to his amusement and delight. 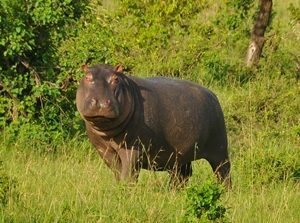 A plump hippo waddled on the river bank and monkeys chattered nervously in the acacias. 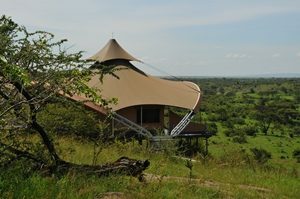 Mahali Mzuri does not have the look of your average tented camp. The striking design, by Kenyan architects, pays homage to the local Ndorobo tribe who in times past used the ridge as a lookout, while the interiors are inspired by the landscape with a natural palate of stone grey, red-oat rust and sun gold injected by bold prints, art and basketry all sourced locally. All the wood was harvested from sustainable sources and the site’s environmental impact was also addressed, with each canopy structure only touching the ground at three points, and all waste water being processed through gravity-fed anaerobic bio-digesters. Each of the twelve tents is strung high above the valley, with six either side of the main camp area. All enjoy wonderful panoramic views and are linked by a series of walkways. Each tent is raised up on a concrete plinth and stretched on a giant arching steel structure, surrounded by a spacious wooden deck. The interior, which is linear in design features a bedroom, living space and luxury bathroom complete with shower and roll top foot and claw bath. The tents are breeze cooled and incredibly comfortable – perfect for our multi generational group. Two of the tents are configured for families and can accommodate four sharing. Although the tent interiors don’t feel huge, especially the family tent where our teenagers slept on wide sofabeds in the living room, there’s everything you could possibly need, from torches and filtered water to bug spray and sunscreen. There’s even a complimentary mini bar in case you fancy a cold Tusker on the deck and don’t fancy the stroll to the main bar. The outside area really does feel generous and has the most wonderful vista. The communal camp area consists of three main sections. The main dining tent has several large dining tables arranged both indoors and outdoors on the deck, with fallen trees as their bases and solid glass tops, as well as smaller tables. 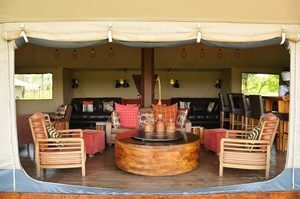 The second central tent is a welcoming lounge and bar area where tasty snacks appear three times a day at dawn, tea and during sundowners. Both of these two open fronted tented areas are linked by steps to a lower decked tier with a large fire pit and further seating. Softly illuminated by lanterns and the glow of a camp fire, this was a wonderful place to sit with a nightcap as Olare’s big male lions warmed up their roar. The third section of the communal camp area, also linked by decking, and favoured by the resident camp hyrax families offers a small gift shop, the office and washrooms. Steps down from here lead to a glorious sundeck and infinity pool, with a small spa on the level below. Stays at Mahali Mzuri are all-inclusive from bubbles on arrival at the airstrip to a warming after dinner amaretto or whatever you fancy – it’s great to be able to budget for all this from home rather than during your holiday and we found it extremely relaxing to know everything was included from the word go. The only exceptions to this rule are the additional activities, for example the spa, community visits and hot air balloon safaris. Food was of a very high standard with several choices offered at lunch and dinner – both being leisurely three course affairs. All our dining was private with our own table set up. The chef would often come out to chat with diners which was a lovely touch. Breakfast included fresh fruit, juices, toast and preserves, pastries and an expansive cooked menu from eggs and bacon to pancakes. For the next three days we followed a safari routine, rising at around 530am in the dark, and escorted by the waiting ‘askaris’ to the lounge for a hot brew and a warm pastry as dawn unveiled the valley. We’d leave at first light, by 630am, kept cosy in the open Landcruisers by lovely hot water bottles, ponchos and Maasai blankets, provided by camp. We’d be out until 930/10am, peeling off layers as the sun got higher in the sky, ready for a big breakfast back at camp mid morning. The middle part of the day was spent having a swim, reading on the deck, watching the wildlife come and go from the valley and eating and drinking. The pool was a great distraction in the heat of the day, especially for the children. The pool deck offers some lovely deep shade. We’d meet in the lounge at 4pm for tea, which was always very sociable with the other camp guests,and be out on safari from 430pm till around 7pm when we’d return for a gin and tonic on the deck before dinner. On our final night we dined by the pool, surrounded by lanterns. After sundown the askaris guide you around camp, ensuring your safety. 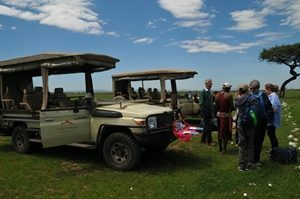 We were able to explore a number of different areas in the conservancy during our stay, crossing rivers and crawling carefully down rocky hills to the wide open plains below, the children taking turns to sit up front with Dickson, completing their ‘warrior’ booklet as they went. Children 6 years+ are warmly welcomed. 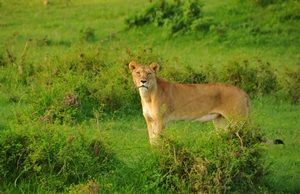 Slinking along the valley, on the opposite side to the river from us, with her coat golden in the morning sun was a lioness. Dickson recognised her and said she had four cubs up on the slopes further along from camp. We waited patiently as she crossed the river and came towards us, almost brushing the tyres of the Landcrusier as she went. The monkeys continued to chatter nervously and as we followed the lioness, a large hippo appeared on the horizon – I’ve never seen a hippo so far from water – it looked like a huge boulder. Suddenly there was a great explosion of movement from a thicket lower down the slope. What looked to be a leopard shot out of the bushes at lightning speed, pursued rapaciously by our lioness, who stretched herself up the tree as far as she could, clawing at the bark. We held our breath. All was still again save for the hippo who continued to traverse the hillside. The lioness lay in wait for a few moments before deciding to continue her journey along the valley. We sat and watched. And waited in the hope the leopard would emerge. 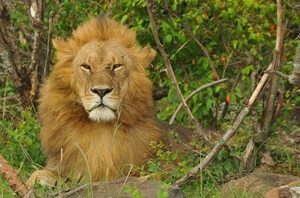 We never did catch up with the lioness and her four cubs – we saw them from a distance and we glimpsed them playing in the trees as a dramatic storm swept through the valley one afternoon, pelting our Landcruiser and turning the sky black and moody. The storm curtailed the afternoon drive a little but it was very exciting. 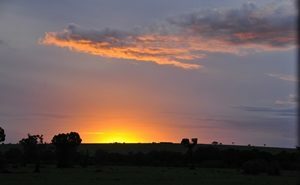 We may not have spent time with the lioness and cubs but our stay in the Mara was not short of big cats – this area is densely populated – we even got to watch a ‘super pride’ of 17 lion hunting warthog, and we also found the two huge male lions who woke us every night with their spine tingling roars. On the second night the roar was so loud it literally felt like the lion was right outside the tent. Thrilling. In the valley and area immediately around Mahali Mzuri we did not see another vehicle – on the other side of the valley, down on the plains, we did see other vehicles, but most of our sightings were enjoyed on our own or with only one other vehicle. This included watching the wonderful cheetah brothers. One of our highlights at Mahali Mzuri was coming across a one hour old baby elephant being nursed by her mother. Truly magical. We stayed watching until well after 1030am before returning to camp for a late breakfast. 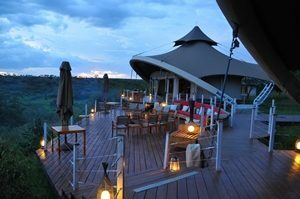 We stayed three nights at Mahali Mzuri and wish we had stayed four – testament to the fact we had a great time. We loved the staff who were all so warm and friendly, from our superb guide Dickson, to the managers Mariana and Wilson. 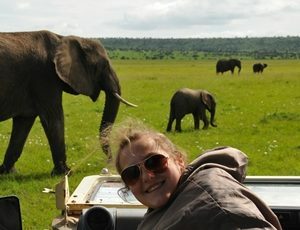 We were incredibly comfortable, saw some amazing wildlife and laughed continually for three days. What more could you want? We chose to travel in the Green season – we enjoyed hot sunny days, some incredible sunsets and sunrises and only one big downpour which arrived just before sunset and lasted several hours. 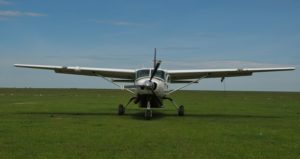 Some of the roads were badly damaged by heavy rain earlier in the month and we had to travel to the larger Ol Kiombo airstrip an hour away from camp to fly on to our next stop because Olare Orok was too soft to land on but other than that the weather did not impact on our plans. Mornings and after sunset it got quite chilly and you needed to dress with plenty of layers but the middle of the day was blazing hot. There are many young animals during the Green Season, the birding is fantastic and the landscape is beautiful. I love visiting at this time of year. 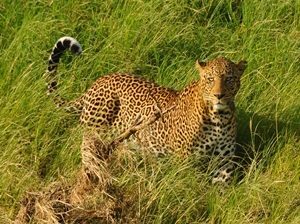 The benefit of the Green season is that there are very few other visitors in the Mara and you can take advantage of lower rates and special offers, for example Mahali has stay and pay offers and also a ‘children go free’ offer running at certain times of year. Look out for these for travel between March and June and often in November time too. We include some offers on our ‘Special Offer‘ page on the website. 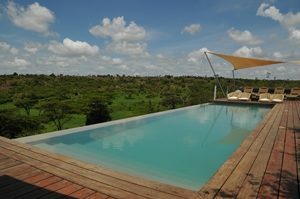 To find out more about Mahali Mzuri please click here. To find out more about Kenya as a holiday destination please click here. 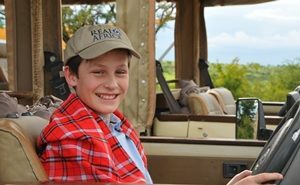 To discuss your family journey to Africa, or for a tailor-made itinerary, please call us on 01603 964 730.